Canada has granted asylum to an 18-year-old Saudi teenager who was feeling abuse from her family in Kuwait. 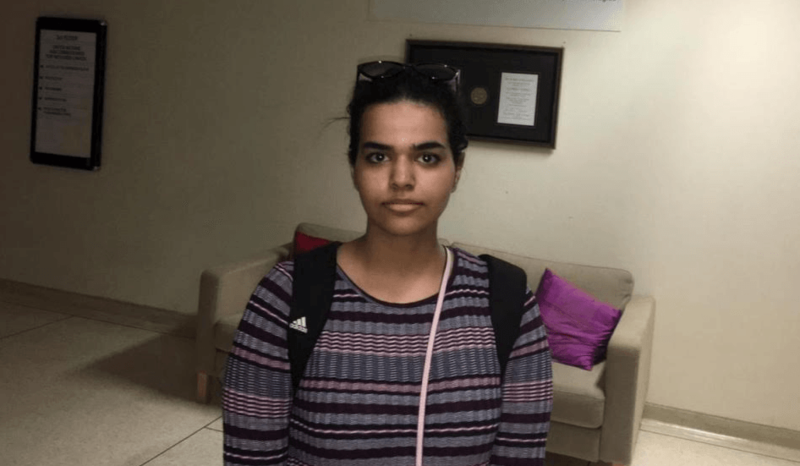 Rahaf Mohammed al-Qunun was stopped at an airport in Bangkok by Thai immigration officials, who took away her passport. She barricaded herself in an airport hotel room in an attempt to prevent being deported back to her family and began live-Tweeting her situation to the world. The news began circulating and eventually Phil Robertson, the Deputy Asia Director of Human Rights Watch, tweeted out that al-Qunun needed access to the United Nations High Commissioner for Refugees (UNHRC). Robertson also began working on the case. The UNHCR granted al-Qunun legitimate refugee status and a number of countries — including Canada and Australia began talks to grant the teen asylum. Today, Prime Minister Justin Trudeau announced that Canada has officially granted al-Qunun asylum. “Canada, as you know, has been closely following the situation with Ms.Rahaf al-Qunun. Our diplomats in Thailand have been engaged with our partners and allies — particularly with the United Nations High Commission for Refugees. The UNHCR has made a request of Canada that we accept Ms. al-Qunun as a refugee and we have accepted the UN’s request that we grant her asylum,” said Trudeau at a news conference in Saskatchewan. Robertson thanked Trudeau, the UNHCR, and Canada for helping with the case. The agency credits the Canadian federal government for arranging her travel, and says her plight gives a glimpse into the precarious situation of millions of refugees worldwide. “Refugee protection today is often under threat and cannot always be assured, but in this instance international refugee law and overriding values of humanity have prevailed,” UN High Commissioner for Refugees Filippo Grandi said in a statement. There are currently 25.4 million refugees worldwide, says UNHCR, and only a fraction of those will be resettled. “Ms. al-Qunun’s case was dealt with on a fast-track ‘emergency’ basis in light of the urgency of her situation,” said Grandi.